Hessepark in Weener (Ostfriesland) attracts artists, collectors, musicians and friends of nature that long for much more than modern and splendid house-design. Surrounded by 8 acres (ca. 32.300 squaremetres) of beautiful landscape this object presents itself as a hidden paradise and a peaceful hideaway. 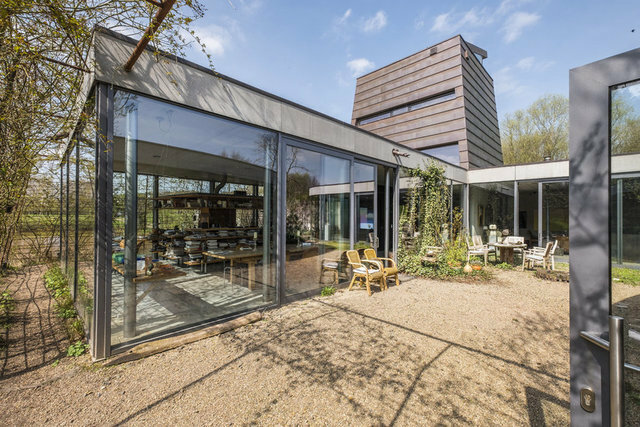 Built by vision and creativity of famous contemporary architect Jan Timmer it consists of a main house, a guest house and a separate art atelier. The ensemble merges with and into nature in a nonpareil style. Characteristic for this are e.g. large window-fronts and a high quality concrete construction. The city of Weener – small, friendly and enchanting – provides the necessary infrastructure for all needs of daily life. By the way, Weener is the only one in the historic region Rheiderland, located on the left side of the Ems river. Leer is by car approximately. 20 minutes away.